Greenon’s Dan Wallace throws the shot put in the Division-II state track competition, Friday at Jesse Owens Memorial Stadium. Beavercreek junior Jayman Peterson takes the baton from Ian Johnson during the Division-I 3,200 relay, Friday at Jesse Owens Memorial Stadium. COLUMBUS — It was a strong start for Greene County on the first day of state track, Friday at Ohio State’s Jesse Owens Memorial Stadium. Tim Stevenson started off the Division III track events with a personal best in the 400-meter race, posting a time of 50.61 seconds to finish seventh and qualify for the D-III 400 final today. “I think I was ranked seventh coming in, and I got seventh, so I was happy about that,” said Stevenson. Stevenson suffered an injury in his first race, however, and had to sit out the 1,600 relay with his fellow Indians. While the injury might have adjusted Stevenson’s expectations for tomorrow, it hasn’t caused him to lose perspective on the fact that he qualified for state for the second time as a relay runner and the first time as an individual. Stevenson’s teammates – Caleb Coe, Brant Wickline, Nick Christman and Everett Harding (who took his place) – ran in the 1,600 relay qualifier, but didn’t advance to the final. They finished 11th with a time of 3:32.53. Coe and Wickline, both seniors, said they enjoyed running in front of the big crowds. “The crowd is huge. It’s an adrenaline rush. This is my second time,” said Wickline. Patrick Hemmert, Dakota Brunsman, Paul Bete and Nikhil Sample represented Carroll in the Division-II 3,200 relay. The Patriots made the podium, finishing in eighth place with a time of 8:01.07. “I think we ran pretty well today. We ran our fastest time of the season. We moved up pretty well throughout the race,” said Bete, who will be a Buckeye next year. Hemmert, who will be at the University of Dayton next year, said he wanted to give it everything he had in front of the fans. “We love it here. It’s a fast track. We get to go to Ohio State, it’s pretty crazy for everyone. I’m not afraid to admit that this is definitely my favorite meet. One of my favorite track memories,” he said. Greenon’s Dan Wallace competed in the D-II shot put competition. While he didn’t podium, he will be throwing the discus in today’s final. 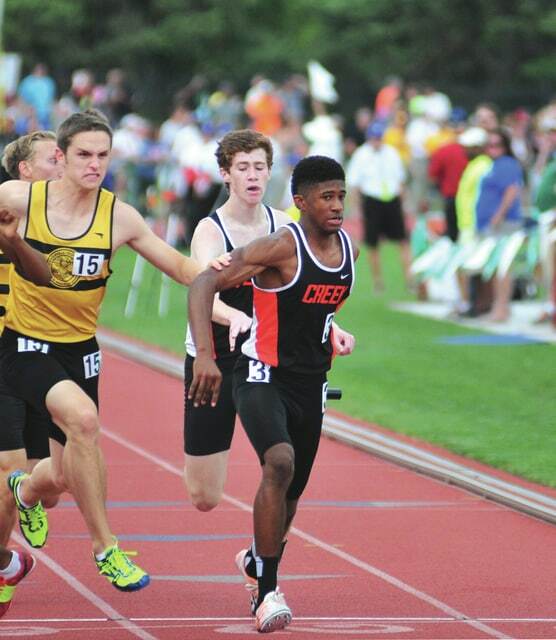 Beavercreek wanted to give a good sendoff to two members of its team in the Division-I 3,200 relay race. While Dan Ewert and Ian Johnson will be back next year, Tristan Tapia is graduating and junior Jayman Peterson is moving. “I just wanted to finish strong for these guys and just run my last race for Beavercreek really well,” said Peterson. The Beavers finished on the podium in eighth with a school record time of 7:57.28. All four runners said that the second lap was especially grueling. Beavercreek coach James Weckesser was happy with their effort. Tapia and Ewert will be back today, competing in the 800 and 1,600 races respectively. Other athletes competing in day-two of state track in Columbus include Xenia Christian’s Grace Norman and Rachel Sweeney at the 1,600 and 800 respectively and Christina Kallet running the D-II 800.